The Govs, who are coming off a program-best 39-19 season a year ago, open the tournament, 12:30pm, Friday versus Louisiana-Monroe followed by a 3:00pm contest versus Wright State. At 12:30pm, Saturday, Austin Peay has a rematch with Louisiana-Monroe, followed by a 5:30pm contest against tournament host UAB to end the day’s action. The tournament will conclude on Sunday with the Govs squaring off for the second time against UAB. “I just want to see our group go out and compete,” Stanfill said. “I want to see their composure in different situations, because everything won’t go perfectly. The Govs, who are picked to finish third in the OVC’s preseason poll after finishing in second place with a 17-4 mark in 2018, return 18 letter winners, including senior Morgan Rackel, Ohio Valley Conference Pitcher of the Year in 2018 and All-OVC First-Team selection. Sophomore outfielder Bailey Shorter, the OVC’s Freshman of the Year and All-OVC Second-Team selection in 2018, returns as well. Also returning are senior third baseman Danielle Liermann (All-OVC First-Team), senior centerfielder Kacy Acree (All-OVC Second-Team), senior outfielder Natalie Schilling (All-OVC Newcomer Team) and senior pitcher Kelly Mardones (All-OVC Newcomer Team). The Warhawks posted a 24-29 record in 2018 and are picked to finish eighth in the Sun Belt Conference’s preseason poll. They return 15 players from last year’s squad — including shortstop Jayden Mount and outfielder Sydney McKay, who were selected to the 2019 preseason All-Sun Belt Team – and seven new players, including four pitchers. The Raiders were 21-32 in 2018 and are picked to finish fourth in the Horizon League’s preseason poll. They return 11 players from last year, including sophomore infielder Madison Whitaker, who was a Horizon League All-Freshman Team selection last year. They also welcome seven freshmen to their roster this season. The Blazers were 26-32-1 overall in 2018 and are picked to finish third in the Conference-USA preseason poll. They return nine players (seven starters) from last year – including infielder Natalie Erwin, who was selected to the 2019 Conference-USA All-Preseason Team. UAB will also see nine newcomers to this year’s squad. The 18 returning letter winners are the most by the Govs in school history. 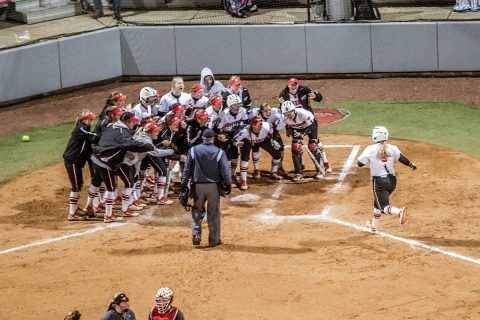 Overall, Austin Peay returns 95 percent of its offense and 99 percent of its pitching from its record-setting 39-win team from a year ago. Two members of this year’s team (Natalie Schilling, Katie Keen) are Clarksville products. Austin Peay will play nine teams this season (18 total games) that played past their respective conference tournaments in 2018. The UAB Tournament will mark the 15th time in program history that the Govs have played in a tournament in the state of Alabama, the third-most in any state, trailing only Georgia (17) and Tennessee (16).